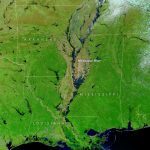 HUNTSVILLE, Ala., June 21, 2016—An experimental tool to give farmers, government officials, environmental groups and other stakeholders an improved estimate of how much water is available in a specific watershed is scheduled to go on line this summer. 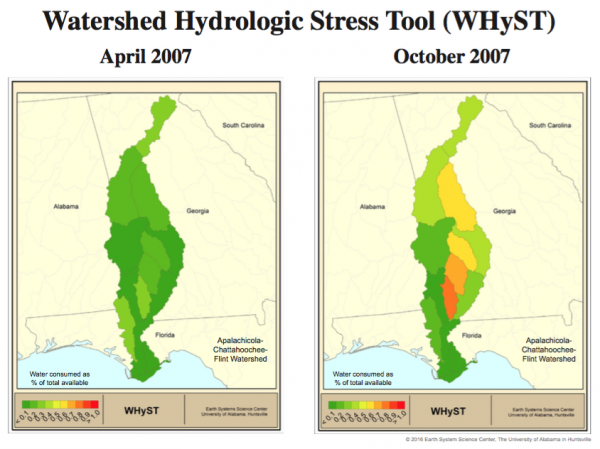 Developed in the Earth System Science Center (ESSC) at The University of Alabama in Huntsville (UAH), the Watershed Hydrologic Stress Tool (WHyST), a coupled crop/hydrology model, uses data from NOAA and NASA weather reports, crop and hydrology models, and water consumers such as city water systems and power companies to produce an accurate, near real-time snapshot of water use and the potential for drought stress in a given watershed. Beginning this summer as a proof of concept, UAH researchers will use WHyST to report each month on water stress in the Apalachicola, Chattahoochee and Flint rivers watershed. The ACF watershed stretches from the foothills of the Smokey Mountains in north Georgia to the Gulf of Mexico, covering parts of Georgia, Alabama and Florida. 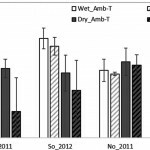 One of several project goals is to better measure the water supply impact of irrigated farming, especially in southwest Georgia. A second goal is to estimate crop loss due to drought for non-irrigated farmers. The WHyST report will initially be released each month during an ACF drought assessment teleconference hosted by the Water Resources Center at Auburn University under the auspices of NOAA’s National Integrated Drought Information System. In addition to providing up-to-date information, the UAH team also will provide historical context. 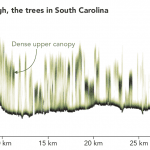 Using historic data on weather, agriculture and population, a historic dataset has been produced so current conditions can be compared to what happened in the past. 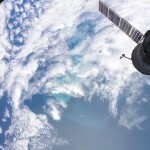 WHyST’s rollout is supported by a two-year grant from NOAA. The University of Alabama in Huntsville is a Tier 1 research university that prepares students for demanding positions in Engineering, the Sciences, Business, Nursing, Education, and the Arts, Humanities, and Social Sciences. Located within one of the largest research parks in the United States, UAH is considered one of the nation’s premier research universities.